I hadn’t booted up No Man’s Sky in more than a year when I first dove into the recent Next update. I had an old save littered with dim memories and obsolete technology, but I decided I was gonna do things right: I was going to start anew. I now regret my decision. Regardless of your feelings about No Man’s Sky’s various iterations, the central promise of the game has always been admirably lofty. Exploration, discovery, and countless sights unseen, all at your fingertips. It’s strange, then, that even after multiple updates that radically overhauled the game from its launch experience, its first few hours remain rigid and predictable as hell. 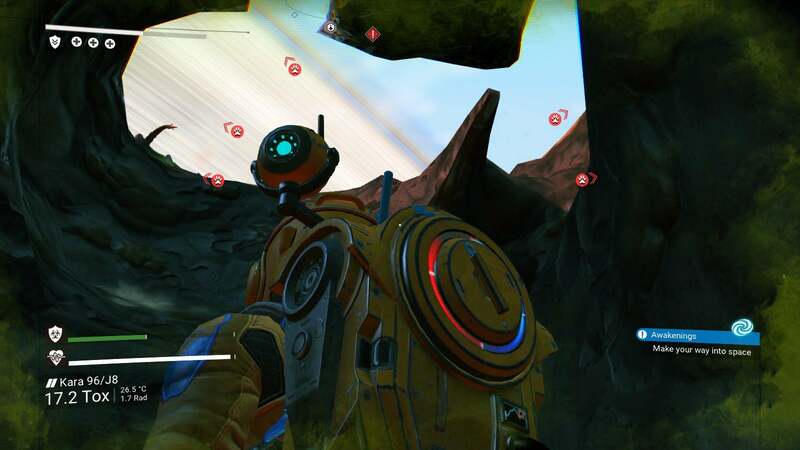 No Man’s Sky is littered with resources, currencies, and crafting systems, so it makes sense that it’d start out by trying to teach you how all these pieces fit together. But it does this by sending you on a series of busywork-intensive errands that, in my experience, obscure the game’s central appeal. There’s a way to do a tutorial for a game like No Man’s Sky that both teaches and offers players glimpses of the wonderment to come, but this isn’t it. The game’s early hours are highly susceptible to the ravages of bad luck. Everybody starts in a different procedurally generated star system, and you can’t leave until you’ve done a bunch of missions that eventually lead to the creation of a warp drive for your ship. My starter system was made up of three planets so humdrum and depressing that I think they gave me seasonal affective disorder. First, my amnesiac main character came to on a desolate poison planet where tendrils of toxic gas began immediately jamming their way down his nostrils. Seconds after the game began, I had to make a mad dash to collect resources to power my suit so that the place wouldn’t kill me. Now, I’ve heard that No Man’s Sky starts you on some kind of hazardous planet no matter what, in order to a) create some tension and b) teach you about the resources you’ll need to regularly gather to power your suit. Fair! But the toxic planet I wound up on had basically no creatures and very little in the way of interesting flora or topography. Exploring it—and I use that term loosely, because I was following the game’s instructions so I could resurrect my busted ship and get the hell out of there—was a drag. So then I took off into space and got my next chore from a mysterious signal. I’d need to go to another planet—this time a desolate tundra riddled with snaking, toxin-ridden tunnels—for reasons I’ve already forgotten and build a base. This involved crafting a base computer, collecting materials to build the base itself, collecting and refining a bunch of other materials to build a terrain manipulator, and a bunch of other things. The short version, though, is that the game would tell me to go to a place and do a thing, and I’d go to that place and do that thing. All along, there was a carrot dangling in front of me, occasionally jabbing me right in the nose: freedom. If I just did everything the game told me, I’d eventually be able to leave this crummy system and its trash planets and plot my own course through the stars. I saw people like Kotaku’s own Kirk Hamilton talking about their adventures and all the weird bird friends they were making. I wanted weird bird friends! More than anything! To be clear, I would have killed to befriend that bird. You heard me. But first, I still ended up having to go to a space station, return to the ice planet to collect materials to build a warp drive for my ship, return to the toxic planet to get antimatter for the warp drive, and run a few other errands that taught me how to construct and use various other tools in between. None of these involved the third planet in my starter system, and it’s just as well, because it was categorised as a “catastrophe.” I visited it on a lark and discovered a grey rock surface with few resources and no life. I could feel my seasonal affective disorder rapidly evolving into lifelong depression, so I got in my ship and never looked back. Throughout this tedious multi-hour process, it was the little things that kept me going. The space station stood out, if only because the occupants, an advanced alien species known as the Gek, gurgled and spat incomprehensible strangeness while trying to bridge the gap between my language and their amalgam of vocalised noises and odour emissions. I also took a crack at the whispering egg trick Kotaku’s Gita Jackson and Chris Person wrote and videoed about, respectively, and I got beaten within an inch of my life by biological horrors who decided I was somehow in the wrong for wanting to sell their offspring for quick cash (the nerve!). Those were fun, surprising times. The rest, though, pretty much amounted to the game telling me way too much and showing me far too little. Now that I’m actually out doing my own thing, pursuing the story at my leisure, and having a pretty fantastic time, it doesn’t even feel like the game really needed to be front-loaded with so much banal tutorialising. Some of this stuff could have easily been introduced after I made my warp drive—after I got a couple awe-inspiring discoveries of my own under my belt. 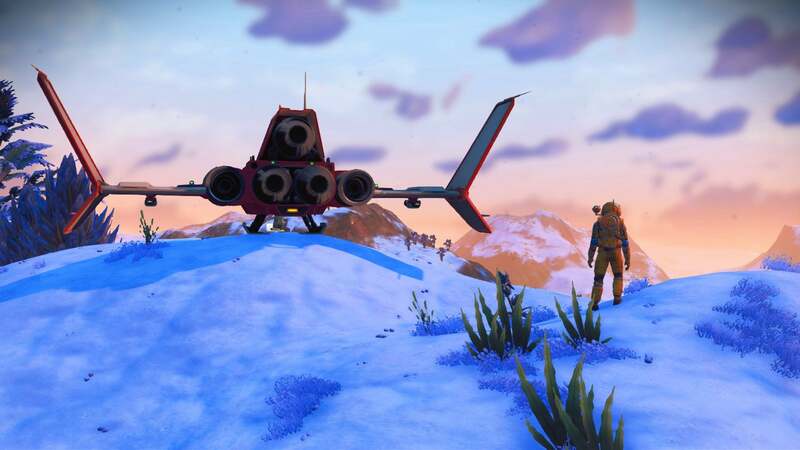 No Man’s Sky has a bunch of fiddly crafting systems and base-building options, sure, but those things don’t set it apart. It’s a game about exploration and discovery, about delighting in a constant procession of surprises large and small. You wouldn’t know that from playing the game’s early hours, though. And frankly, I couldn’t blame you.